A hygrometer is an instrument used for measurement of the moisture content in the atmosphere. These instruments rely on measurements of factors such as temperature, pressure, mass or a mechanical or electrical change in a substance. Through calibration and calculations, these measured quantities can be used to measure humidity. Modern hygrometers use temperature of condensation, or changes in electrical capacitance or resistance to measure humidity differences. Major application of hygrometers include greenhouses and industrial spaces where humidity is a major factor for operations. Hygrometers are also used in some incubators, saunas, humidors and museums. They are also used to preserve wooden musical instruments such as pianos, guitars, violins and harps which can be damaged by improper humidity conditions. In residential applications, hygrometers are used to assist in humidity control. This report identifies the global hygrometer market size in for the year 2014-2016 and forecast of the same for year 2021. It also highlights the potential growth opportunities in the coming years, while also reviewing the market drivers, restraints, growth indicators, challenges, market dynamics, competitive landscape and other key aspects with respect to global hygrometer market. 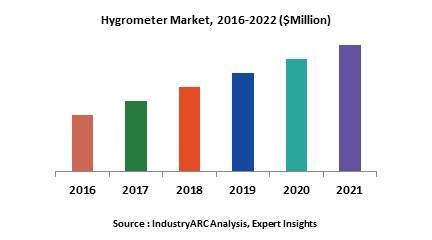 Geographically increasing Europe and North America are key driving the market for Hygrometer. Growing population and industrialization in developing countries of Asia Pacific are estimated to drive the growth in this region. Asia-Pacific is estimated to witness the highest growth during the forecast period and Europe is estimated to hold the highest share in hygrometer market.